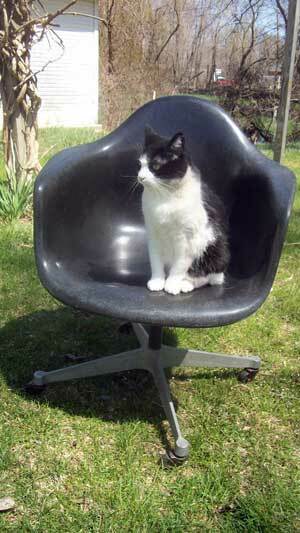 I found this used Herman Miller chair in a junk shop for $3.99. In the town where I lived 20 years ago, a local newspaper offered free classified ads on Saturdays. You could list any item for sale with a price of $69 or less. One Saturday I saw an ad for two Herman Miller chairs, I think they were priced $35 for both. Knowing Herman Miller was a name of distinction I phoned the number in the ad. A lady said they were still available, so I went and looked at them, and I bought them. Both were shell chairs by designer Charles Eames. Fiberglass molded into a shape suitable for holding the human posterior in distinctive style. One was covered with chartreuse fabric, the other simply yellow fiberglass. They were not so unusual to me, for when I was young, such chairs were common. The middle and high schools I attended had many of them, as did some commercial offices and lobbies. When I bought these two chairs for $35 years later, the internet was in its infancy, so I was unable to look up their value. The chairs cluttered up my small apartment for a while, and one day I guess I felt the need to liquidate. I advertised the chairs for $50 each and got one phone call — a yuppie couple 40 miles from me who wanted to come see the chairs right away. I pretended to be oblivious to the pitiful deal I’d negotiated for myself and merrily went on to show them an old bicycle that was cluttering my bedroom. No thanks, they said. Just the chair. So I made $15 over the price I’d paid for the two chairs, not including the gas and time I’d spent to acquire them. Such a marketeer I am! As for the second chair, the chartreuse one covered in fabric, I wish I could tell you I sold it for a fortune. But it hung around for a long time. I figured if the yuppie couple were experts and didn’t want it, it wasn’t worth much. The chair got dirty — things in my care do that — and I think it even got wet in the rain and began to come apart. Eventually I discarded it. But my pitiful deal for the yellow chair stuck in my mind over the years as a reminder that Herman Miller shell chairs, should you find one in a junk shop, are a real find. You might not notice them right away. To the uninitiated, such a chair might just look like it came from the grade school where you learned long division or a lobby in which you once sat waiting to renew your driver’s license. The edges of the chair might have small chips out of the Fiberglas, leading you further to conclude it has no particular value. And I am glad to say, I wasn’t. That is, when I was in a local charity thrift shop a couple of years ago, and a man was asking a store clerk about a certain desk. It was a cheap thing made of pressboard — the kind of furniture you often see sitting by the curb waiting for the trash man. She told him the price of the desk, a few dollars, and I was jealous — suddenly I wanted the desk. Why had I not seen it first? But as I looked at the desk I had missed out on, I noticed next to it a certain chair. Gray-black, Fiberglas molded into a familiar shape, some minor chips along the edge. The price tag said $3.99. When no one was looking, I lifted the chair and turned it over, There was a familiar logo and the words I’d hoped to find: Herman Miller. Being careful to appear as casual as if I was buying a chair that was really worth only $3.99, I took it to the counter, plunked down payment and hurried it to the car. Once home I took care to photograph it well, then listed the shell alone — not including the base — on Ebay with a starting price of $9.95 plus $29.95 shipping. Eight bidders sought the chair over the course of a week and and the winner bid $226.49. As I had agreed to in the listing, I shipped the base separately for the cost of shipping. From what I could tell, the buyer had the chair shipped onward, at his or her own expense, to Japan. Other names to keep an eye out for in vintage modern mid-century collectible office furniture include Selig, Kroehler and Knoll.